The Henry Luce III Center for the Arts and Religion welcomes everyone who is interested in the intersection of art and faith. We invite established and emerging artists to apply to our Artist-in-Residence program or make a proposal for a show in the Dadian Gallery. We also have opportunities for pastors or theologians who wish to stay with us for few weeks of sabbatical, reflecting on and engaging with the arts in conversation with our faculty and staff. 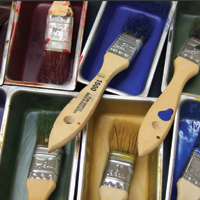 The Henry Luce III Center for the Arts and Religion (LCAR) Artist-in-Residence program accepts applications from visual artists seeking to create within the community of Wesley Theological Seminary. 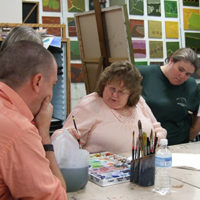 Artists share space in a communal studio set in the seminary’s instructional building, working directly with students by leading practical art classes and community art projects. Teaching an Arts Practicum in the medium of the artist’s choosing is expected of all Artists-in-Residence. Opportunities for outreach to churches and the wider community are also available to resident artists. In alternating years, a group show in the Dadian Gallery is organized to highlight the work of Artists-in-Residence. 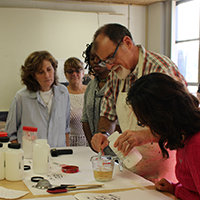 Artists also contribute one piece of work to the seminary as part of their residencies, providing a lasting contribution to our mission of making the arts an integral part of theological education. Artists have the option of taking one seminary class per semester in order to further explore the union between theology and the arts. Artists are provided with an honorarium of $1,500.00 per semester to help cover their living expenses. A one-bedroom apartment on campus is provided for artists living outside of the greater Washington, DC and Baltimore region. Residencies can be for one calendar year, one academic year, or one semester, depending on the needs of the program and the availability of artists under consideration. Please be aware that we schedule our artists one to two years in advance. Please submit application/materials and portfolio by requesting a secure upload link from artsandreligion@wesleyseminary.edu (more information in the pdf below). The annual application deadline is May 15. For an application and additional information, please download the PDF and follow the submission instructions. We regret that at this time, we are unable to process J-1 visas for international artists. The Dadian Gallery exhibits art that addresses religious and cultural issues, as well as matters of the universal human condition. Works are not required to be explicitly Christian or include religious content. We review portfolios on a rolling basis for individual and group exhibitions. Please let us know if you are willing to be considered for inclusion in group exhibitions. The Dadian Gallery typically schedules shows one to two years in advance.